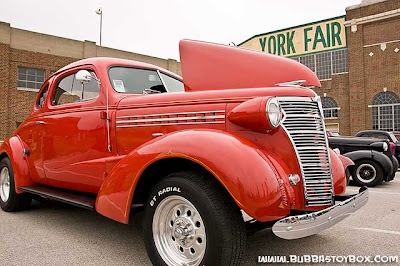 It was just too darn hot at this year's Street Rod Nationals East in York, PA. There were plenty of car and trucks to look at during the event. The buildings were packed with people trying to escape the heat while viewing what the vendors had to offer. Our '48 Ford really needs a tune up; it's running rough. Also since the car doesn't have air conditioning, anything less than highway speed was brutal. We still had fun and also the best strawberry shortcake I have ever had during lunch. Check www.myrideisme.com for more photos.